Pala della Beata Umiltà :: Pietro Lorenzetti ► 1280-1348? The altarpiece, dating from around 1340, was reconstructed according to an 18th century drawing. 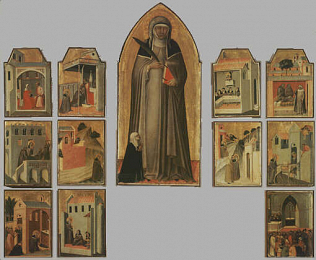 Originally in the women's convent of San Giovanni Evangelista in Faenza. At the Uffizi since 1919.